Genome engineering, the method to make targeted specific modifications to the genome of a living organism, has become more accessible, efficient and easier to use in recent years. Current technology using programmable nucleases (ZFNs, TALENs, CRISPR/Cas9) to make targeted genetic modifications at a specific location has opened up a wide variety of options for scientists in both therapeutic and biotechnology disciplines. These include generating disease models in cell culture and animals, evaluating gene function in vivo, correcting genetic errors, and even inserting synthetic genes. To enable precise genetic modifications, a break is introduced in a specific location in the DNA of an organism by an engineered nuclease. This stimulates endogenous DNA repair mechanisms (non-homologous end joining, NHEJ, and homology directed repair, HDR), and these cellular pathways can modify genetic material at the site of the break. NHEJ is error-prone and can result in small insertions and deletions at the site of the DSB. In the presence of an exogenous DNA molecule that contains desired sequence flanked by DNA homologous to the target site, HDR can result in perfect insertion of genetic material and thus is a popular approach to precision genome engineering. Despite the relative simplicity of this technology, limitations still severely decrease the efficiency of the system and create obstacles for users. 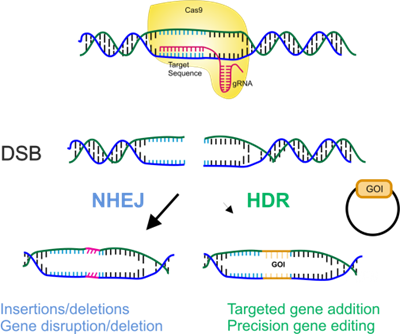 Competing activity of NHEJ limits the efficiency of HDR mediated gene targeting. Low targeting efficiency = extensive resource effort to identify a single modified cell. Competing activity of NHEJ can result in non-specific insertion of donor DNA into random double strand breaks that occur throughout the genome. Non-specific gene insertion can lower overall efficiency of gene targeting, and can be problematic for therapeutic and biotechnological regulations. Rationale: Inhibition of NHEJ increases the activity of HDR. Increasing the efficiency of HDR would render nuclease mediated genome engineering a faster, easier and more accurate process. Inhibition of the NHEJ pathway to increase HDR activity. 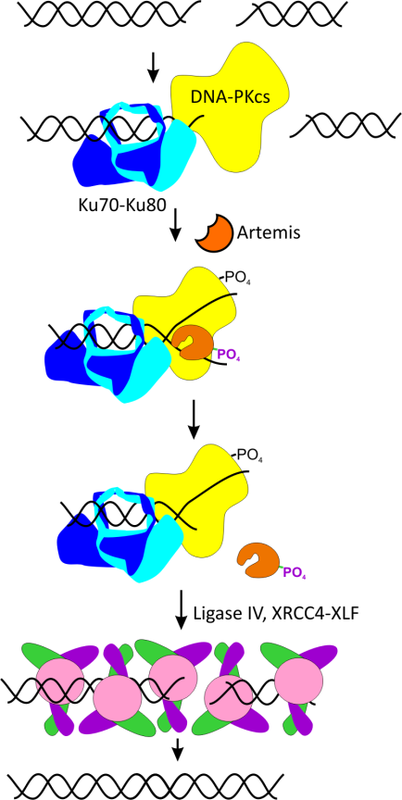 Inhibit NHEJ activity by targeting the Ku protein, the initial protein to bind to broken DNA in the pathway. Inhibition of Ku-DNA binding, the first step in the NHEJ pathway, renders DNA double strand breaks unprocessed and eligible for HDR engagement. Genetic studies done by knocking down Ku expression have shown increased HDR mediated genome editing. Chemical inhibition of Ku binding activity promises to have greater potency combined with controlled response in a time and concentration dependent manner.